A 10-day truce was not extended after the government said separatists were ‘unwilling to control terrorist units’. UKRAINIAN TANKS AND fighter bombers have launched a ferocious assault against pro-Russian separatist insurgents after rejecting European attempts to save a tenuous 10-day truce. Western-backed President Petro Poroshenko told the nation in an emotional late-night address that his peace plan for Ukraine’s worst crisis since independence was being used by the militias to regroup and stock up on heavy arms from Russia. “After examining the situation I have decided, as commander-in-chief of the armed forces, not to extend the unilateral ceasefire,” the 48-year-old said from his office. The separatists’ leaders have demonstrated their unwillingness and inability to control the actions of the terrorist units and marauding gangs under their control. Ukrainian defence ministry spokesman Oleksiy Dmytrashkivsky said a “massive artillery and air offensive” had been unleashed in the eastern rustbelt — home to seven million mostly Russian speakers. Russia immediately expressed its “deep regret” over Poroshenko’s decision while France’s foreign minister promised that there would be no letup to Western efforts to bring a lasting peace to Ukraine. Moscow warned the authorities in Kiev they would be held responsible for the ongoing military operation. “One will have to answer for the crimes against peaceful civilians,” the foreign ministry said in a statement. We demand that Ukrainian authorities stop shooting at their own country’s peaceful cities and villages and return to the real and not pretend ceasefire to save people’s lives. Both separatist fighters and pro-Kiev leaders reported heavy exchanges of artillery fire and air bombardments across the economically-vital Russian border regions of Lugansk and Donetsk. The regional administration of Donetsk — which along with Lugansk has declared its allegiance to Moscow — said four civilians were killed and five wounded when their bus came under fire near the town of Kramatorsk. 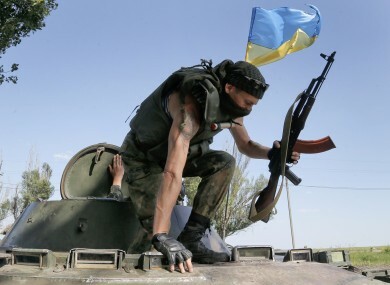 Both rebels and Kiev confirmed a heavy tank battle being waged in near the Donetsk region town of Karlivka and intense clashes in the nearby village of Mariinka. The Donetsk administration said the region’s roads had become too dangerous for travel and suspended several intercity bus routes. The unpredictable spells of fighting have also claimed the lives of an Italian photographer and several reporters from both Russia and Ukraine. Western-backed Hromadske TV in Kiev on Tuesday reported the abduction of one of its journalists and a cameraman in the Lugansk region. Poroshenko’s decision came just hours after the leaders of France and Germany joined him on a conference call to Russian President Vladimir Putin — the third such conversation in five days. French President Francois Hollande and German Chancellor Angela Merkel were in rare agreement with Putin that Poroshenko should extend the truce to give indirect talks between separatist commanders and Kiev a chance. But the contacts have mostly failed to halt 11 weeks of fighting that have killed more than 450 people and shuttered dozens of coal mines and steel mills whose operation is vital to Ukraine’s teetering economy. Email “Ceasefire falls through in Ukraine as military launches 'massive offensive'”. Feedback on “Ceasefire falls through in Ukraine as military launches 'massive offensive'”.